I don’t know who this character Ben Caspit is. But I have absolutely no respect for him. What he has done – no doubt in the safety of his own office at the Jerusalem Post - is write a hit piece on Gilad Shalit. I can think of little else more appalling than ripping into a man who while serving his country was kidnapped by Hamas terrorists for 5 years. Admitting that he was opposed to the deal that freed him and asserting that the jury is still out about whether it was the right thing to do – he goes into detail about the circumstances of Shalit’s capture. Based on Shalit’s own detailed account he hammers away at how this could have all been prevented had Shalit done his duty properly. How a man sitting in an office can criticize someone who sat in a prison for 5 years fearing he could be be-headed at a moment’s notice – is beyond me. It is beyond Mentchlich in fact. His criticism amounts to Shalit’s dereliction of duty in that he did not follow procedure during the attack. Had he done so, Caspit says – the entire episode may have been prevented. That’s easy for him to say. He was not under rocket attack when he made these judgmental comments. Shalit and his fellow soliders in that tank were under deadly attack. Can Caspit say that he would have acted any differently? Taking advantage of Shalit’s soul searching debriefing by the military - Caspit reports that by Shalit’s own admission he did not pay attention to details provided by his tank commander. He simply relied on him and would follow any order by him based on his knowledge. But even if he had known the details- it is not that uncommon for people to panic when they are under attack. No matter how much training they had. In fact the tank commander panicked and did not follow procedure either. By leaving his tank he got himself killed. Shalit stayed in the tank and his life was spared. Caspit says that he could have notified nearby troops or used the weapons in his tank that were still operational… or just come out of the tank with ‘guns ablazin’ …and that could have very well taken care of the situation. He decided not to do any that. And instead was ultimately captured. All easy for Caspit to say. But Shalit had no way of knowing how many attackers there were or whether they too had nearby reinforcements. He believed that if he had left his tank firing he would have been killed by an overwhelming force outside the tank. He decided to stay put and not resist by force. And because of this his life was spared; he was captured… and ultimately released. One can debate whether Shalit did the right thing or not. In my view saving his own life was paramount. So whatever action he took in that vein was the right thing to do. One could argue that he should have died trying to resist being captured. I think that’s what Caspit was getting at – without actually saying so. But… let him walk a mile in Shalit’s shoes and see what he does then. Today one and a half years after his release, I am proud to say that I supported the deal that got him released. 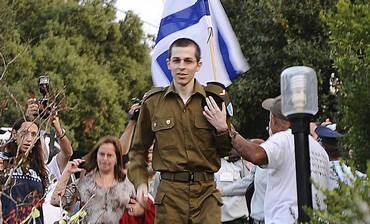 I cried out for any deal that would save Shalit’s life - a Jewish life involved in serving his country in dangerous ways. I strongly urged the Israeli government do whatever it took (short of actual murder) to ascertain his release Even in the face of strong criticism by those who felt the price for saving Shalit’s life was too high. The claim was made that the danger that terrorism would increase and more people would die as a result did not deter me. Releasing all of those Palestinian prisoners – some with blood on their hands in exchange for his release was a scary thought. But not as scary as allowing an innocent soldier to remain in captivity in enemy hands. A cutthroat enemy. Literally. Prime Minister Netanyahu did the right thing. He authorized the exchange and saved a young soldier’s life. A young soldier that clearly was put in harm’s way to guard the border between Gaza and Israel. What about all the predicted fallout by the naysayers? Didn’t happen! Could it still? Sure. World War III could break out too. But neither of those have happened and the more time passes the less likely that the release of those prisoners will have anything to do with anything bad. Caspit says that despite his opposition to the deal that gained Shalit’s freedom, he teared when Shalit was actually set free by his terrorist captors. What human being with a heart didn’t have those feelings? I sure did. Caspit showed his humanity then. He should have stopped while he was ahead!